The museum has several different educational opportunities to offer to schools and Home Schoolers. 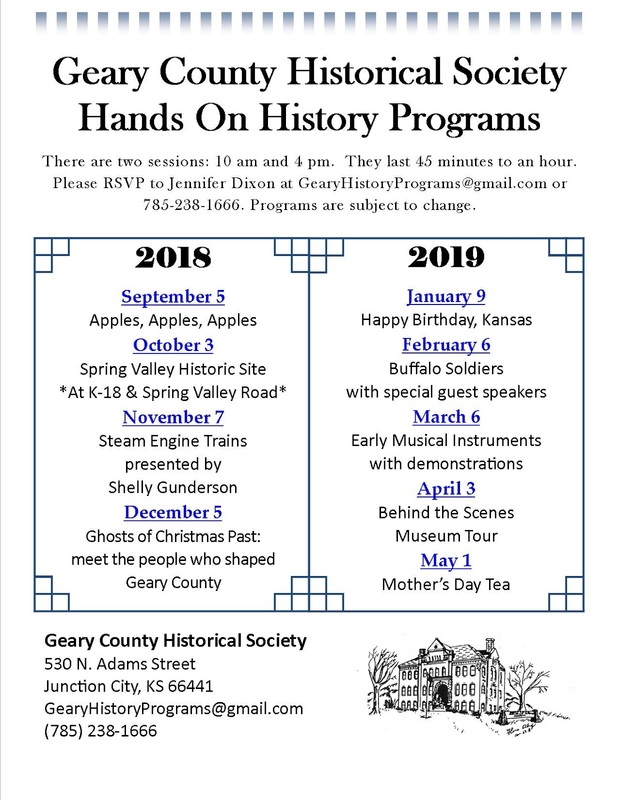 The Geary County Historical Society has 9 hands-on traveling trunks available for free presentations. A volunteer will bring the trunk and present the items. Presentations are between 30-40 min. Children can handle the contents of the trunk if time allows. Coming to Kansas: Imagine you are moving to Kansas, but can only bring what fits into a covered wagon. Some necessities that pioneers brought with their families were food and cooking supplies. What else would you bring? A few of the items in the trunk are maps, cooking materials, and a model covered wagon. Children’s Chores: Pioneer children cared for animals, made butter, cut wood for the winter, sewed clothes, and ironed as part of their daily chores. Children helped in all aspects of the household from the time they began walking. They were rarely paid for their chores. There are a variety of items in this trunk, such as a chart of daily work, washboard, sawbuck, and milking stool. School Days: What if there were only three months of school? That’s how long students attended the Spring Valley Schoolhouse at that time, and the teacher was paid a whopping $20 for her service. Many of the classes were similar to today and the trunk holds a spelling book, a 4th grade reader, an arithmetic book, writing samples and much more. The Spring Valley Schoolhouse, a one-room schoolhouse, is also available for field trip, and tours. Fun before Nintendo: We often hear children say “I’m bored,” even with the Internet at our fingertips. Children throughout the ages have created many games, some still popular today. This trunk displays past and present entertainment including checkers, Dominoes, telephones, corn husk doll making, and adjustable roller skates. This is a great hands-on presentation. Old, But What Is It? : Guess what the items are in this trunk by looking at and touching them. Most of the collection has simple tools from the 1880s to 1920s. There are objects from the past to compare to their current counterpart, like a camera or curling iron. Discover interesting surprises in this presentation and, in some cases, be thankful for advances in technology. Happy Days: What was life like as a 1950s teenager? Travel back in time to the beginning of rock & roll and pop music featuring records with artists like Pat Boone, Guess Who, and Ricky Nelson. Included in this display is a prom dress with crinoline, and saddle shoes. The trunk also contains more clothing, toys, and accessories of the 1950s. It’s like a sock hop in a box. Tilling and Toiling: A barn was once considered a status symbol. Farming and self-sufficiency were critical to pioneer families. These families did all the work mending fences, tending cows, sheep, horses, mules, chickens, and growing wheat, barley, oats, and hay. This trunk contains many tools used in farming life. Life in the Trenches: WWII: A soldier’s life in World War II was difficult. Many items like food, books, gas, and shoes were rationed. They slept in fox holes in the ground and carried gear weighing up to 117 pounds…that is like an extra person on your back! Among many items, this trunk includes uniforms, bags, dummy grenades, and a First Aid Pouch. See what it’s like to be a soldier for a day. WWII: Life on the Homefront: What was life like as a child growing up during World War II? Kids were more involved with helping the war effort than ever before. They collected scrap metal, tires, and milkweed to send to the Army. Learn about Victory Gardens and V-mail, and discover why there is a parachute in the trunk!